admittedly, the white plastic looks a bit cheesy, but I can paint it later if I really feel like it, and the price is right ( you can get 20' of pipe (yes feet not inches) from any self-respecting hardware store for less than $5) the barrel might be a little long, but I can always cut it down later if I need to. I fired a few test shots, and it seems to work fine, no chopping, and better accuaricy. You might have also noticed that in the pic I have a 48cu.in. HPA tank screwed onto my gun. Also in the persuit of money-saving, I purchased it and the fill station you can also see in the pic, tank was ~$40 and the fill station was ~$20 from amazon.com and ebay respectively. 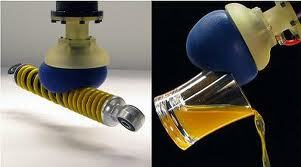 The fill station screws onto a scuba tank, and lets you fill your paintball tank anywhere you can lug a scuba tank. I borrowed a scuba tank from a friend, and since I can get it filled for free, I will have paid for my purchases in 6 fills, not bad considering I plan to go more than 6 times in the future, and my a few of my friends who do not want to shell out for all the new stuff said they would buy HPA tanks and buy fills from me for ~$2-$3. Doing more with less FTW! I have been interested in mini-sumo for a while, and I was thinking about how I could make an (almost) unbeatible robot. I have come to the conclusion that competeveness comes down to a cupple important things: traction, low profile fronts (traction does no good if the other guy gets under you and ruins it all.) quick response time while searching, and just enough power to push the other guy out. Ideally, tank treads covering the whole 100sq.cm (or almost anyway) with a scoop that deploys down would be the best (have a look at "the beast") However, building something like that is out of the question for most hobbiests, so I have come up with what I think would be almost as good, namely a walker. Now before you call me crazy have a look at this pic, and see that the walker I propose is not your average biped. The bot will have almost ( the walking method requires some blank space, as evedenced by the drawing ) half of the possible area on the ground at any time, and sometimes all of it, which, if covered with an approate high-traction material will give a ridculas amount of grip. 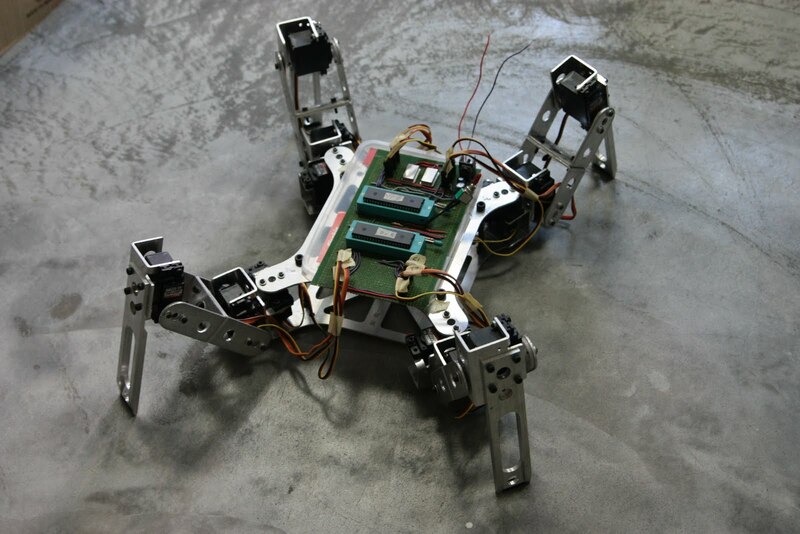 The centre circle will be driven by a gearmotor in order to turn the bot, it does not﻿ need to be overly powerful, but fast enough to spin the bot at a good enough rate to not let it get ambushed from behind. 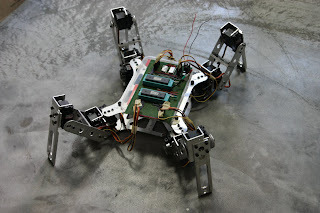 The walking mechanisim will be driven by a cam system much the same as "clunkers" but with a much smaller cam, the bot does not need to take big steps, nor go fast when pushing, and will be able to get by with a less torquey motor. At the begining of the match, the front plate will fold down giving the bot a nice low profile wedge front, and will also be hinged as in the picture so that if a robot hits the side of my bot instead of dead on the walker will still possibly be able to get under by continuing to rotate. As for opponent detection, just about any method will work, be it mechanical, optical, or sonic. I worked on the hog drive again last night, I made a gimbal bracket out of lego, hot glue and a servo. Ultra high quality I know, but 1, good enough for a prototype, 2, I was going to use aluminum, but lego is better for rapid prototyping (that, and my hacksaw does not have a blade right now...) 3, lego is still pretty sturdy, and 4, the rest of the frame is going to be lego anyway, so the bracket and base should fit together fine. The gimbal that you see is for driving, and can move 180 degrees left and right. To steer, it will rase and lower it's rear wheels in tandem, causing a tilt of the whole bot to a "nose up or nose down" attitude. I sort of struggled on how to make the whole bot run, I have seen both a straight up 2 axis gimbal, and one bot that independantly rased or lowered each wheel to drive and steer. I chose the hybrid method because I wanted to have maximum travel latterally so that the whole hemisphere could be used for driving, and max top speed could be reached, and to do this with a regular gimbal would have been tough. I will not get max travel for steering, but really, I do not need to turn at 150 km/h, that is just a bit excessive... We will see how this system works for a first prototype.